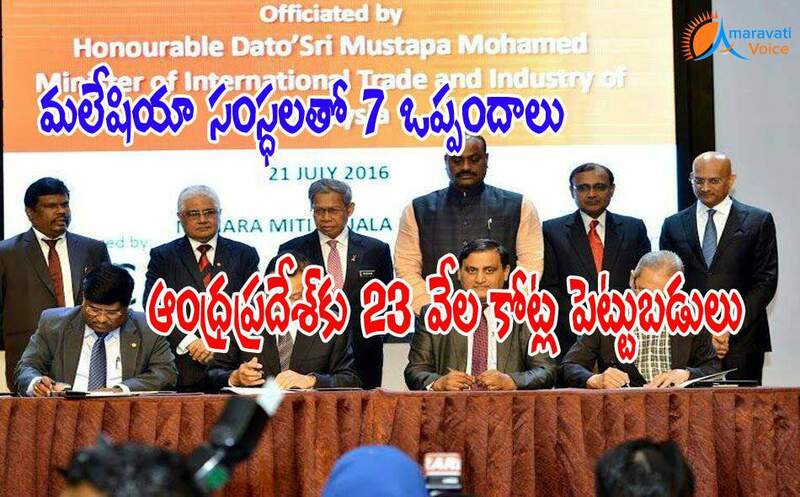 The Andhra Pradesh will have Rs.23,000 crore Malaysian investments. Around seven MoUs were signed in Kaula Lumpur on Thursday. In the "Asian India business leadership summit” held at Kaula Lumpur, the delegation led by minister for youth services, labour and employment Kinjarapu Atchannaidu, had detailed discussions with the representatives of the Association of South East Asian Nations (ASEAN). Following the discussions, several Malaysian companies have come forward to invest in Andhra Pradesh. The Malaysian biodiesel association (MBA) has expressed its willingness to set up oil palm related bio diesel products project in Andhra Pradesh. The MBA has arrived into an MoU with APEDB in this regard, which will facilitate employment to 5,000 people, with an investment of Rs.6,713 crore. Anta Strategic services has expressed its interest to set up reproductive fuel project with in initial investment of Rs.167.50 crore in AP. It has reached an agreement in this regard with AP Economic Development Board (APEDB). The Malaysian police cooperative corporation companies - Protasco Berhad and Kop Mentap Berhad - have also signed an MoU with APEDB, to set up water purifying project in AP with Rs.3,360 crore estimation. Malaysian commerce and industries minister Mustafa Mohammed has suggested to the APEDB to set up an office in Malaysia for better cooperation.